In large skillet, heat oil over medium heat. Add onion, jalapeno, garlic, tomato, green onion, zucchini, and corn. Cook, stirring often until vegetables start to soften, about 2 minutes. Add cilantro and pepper. Set aside in colander to drain over a bowl. 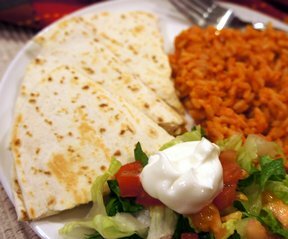 Place tortillas in hot, dry medium skillet over medium heat or on a hot grill. Warm until pliable, then spoon two tablespoons each of the vegetables and cheese. Fold tortillas in half and toast for about 2 minutes on each side until quesadillas are lightly browned. Keep turning them in the pan until the tortilla is very hot and the filling melts. Meal Plan: Begin by preparing some quick-cooking brown rice and make a simple salad with fresh tomatoes and avocados.